Saints earned a valuable away point in a match where some key players were rested and some of those that did pay had below par performances. After a string of good team performances, Puel chose to leave Fonte, Austin and Davis behind and sit Højbjerg, Cédric and Tadić on the bench. Hesketh started the game, but was substituted after just 35 minutes, but to be honest that was probably tactical, with Hapoel Be’er Sheva having over 70% possession up until that point. There were at least two other players that could easily have been pulled at that point, but bringing on Tadić at least stopped the rot. Saints had a wonderful chance right at the start of the game, when they won a free kick near the Hapoel Be’er Sheva penalty area and Ward-Prowse swung over a glorious cross, but van Dijk's header threatened the corner flag, more than it did the Hapoel Be’er Sheva goal. That was as good as it got for Saints in the first half, as the defence had to deal with wave after wave of attacks. The Israeli team had so much possession, that it was clear something needed to change. Just after the half hour that came, with what I hope was just a tactical switch of Tadić coming on for the unfortunate Hesketh. The youngster certainly wasn't the worst performer on the pitch, with both Long and Redmond looking anonymous at best. 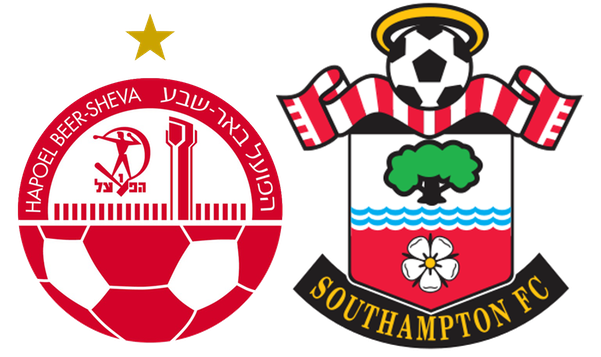 The introduction of Tadić immediately stabilised things and Saints looked far more solid. The end of the first half was reached without major calamity (i.e. conceding a goal) and the chance to talk to the team and put things right. Indeed, in the second half Saints did in fact show more intent, with James Ward-Prowse coming closest of anyone in the away team, at least making their goalkeeper work for his wages. Hapoel Be’er Sheva were well organised and you could see why they had beaten Inter Milan away from home, but by the same token Saints were well organised and didn't give the Israeli side a chance of the win. So, a goalless draw was probably a fair result in a game that will not linger in the memory for long. The good thing is, that after two games, Saints are top of Group K on four points. Oh, and there were no injuries. Claude Puel is turning out to be rather good at this squad rotation lark. Things are looking good. Sorry for the rather brief report, but there really was not much more to say about the game….